Do you need a professional legal consultation in your case according to the Ukrainian legislation? Make an appointment or call Artem Yemets, an experienced Ukrainian lawyer in Zaporozhye (Ukraine). Do you need experienced legal representation in your business or personal matters? Artem Yemets started his legal career in 2004. More than 10 years he has been working independently and in partnerships with notaries, legal and law firms. He has impeccable reputation and extensive experience in civil, family, housing, administrative, labor, economic and other branches of Ukrainian law. Make an appointment for a free Lawyer Consultation in Ukraine. 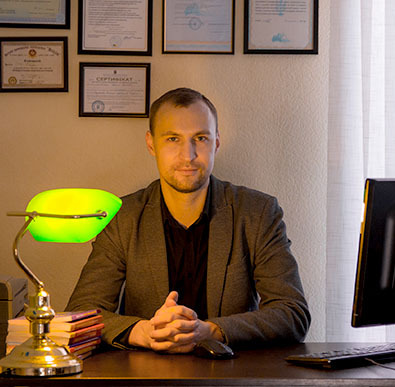 Lawyer in Zaporozhye Artem Yemets helps his clients to solve legal problems by providing quality legal services. Convenient office in the center of Zaporozhye. Experienced Lawyer For Your Case with Many Legal Specializations Legal services in any country are complicated and that’s why required lawyer assistance and consultation. Ukrainian legislation has thousands of laws and amendments. Most Lawyers specialize in certain branches of the law. Registration of Physical Entities as Individual Entrepreneurs in Ukraine. Complicated Ukrainian legal system is always changing. That is why it often requires detailed evaluation of your legal situation and needs. Sometimes a wrong move or incompetent advice can have very negative consequences for a person, family and business. Therefore, you have to choose the best lawyer, the best legal professional to protect your life, assets and future. Only a qualified specialist can give you the right advice and legally assist you by solving a problem or winning a case. You have to find and hire Experienced Lawyer in Ukraine. State Lawyer License. According to the current Ukrainian legislation only a licensed lawyer has a right to practice law and represent a person’s interests in courts. No lawyer will guarantee the victory in your case. If a lawyer promises you 100% victory in your case, he is lying. Only a judge can take a decision on the case; nobody can guarantee it. You should insist on personal attention of the lawyer to you and your case. There are many big law firms offering legal services in Ukraine. As a rule, such firms consist of many partners, senior and junior lawyers, associates, paralegals, secretaries, and bookkeepers. The advantage of such big firm is the wide range of services but the pricelist and a large number of employees are their disadvantage because such firms have a complex structure. Partners and lawyers do not know what they are doing and have a little coordination. In big firms there is lack of efficient communication between the client and the lawyers. Your case will be tossed around and you will never meet a lawyer who is personally responsible for your case. Consequently, lawyers are overloaded: they often do not know all the details of your case. It can negatively affect the result of the case or representation at the court hearing. Big firms are focused only on profitability and often do not value their clients. It is the best-case scenario when the lawyer talks to you personally, reviews your documents personally, and conducts your case personally. It means that he take personal responsibility for your case. As for me, I always meet my clients personally; I always conduct the cases and never hire subcontractors. Надо ли регистрировать установленное на автомобиль ГБО в органах ГАИ? Как купить квартиру без посредников в Украине? Квалифицированный адвокат Емец А.Ю., предоставляет полный комплекс юридических услуг по иммиграции иностранцев в Украину. Кроме того иммиграционный юрист защитит интересы иностранцев в таких случаях как выдворение иностранцев за пределы Украины и отказ иностранцу в получении временного или постоянного вида на жительство. How to divorce in Ukraine? Divorce in Ukraine can be by agreement at civil registry or in court. Consult a reliable family lawyer in Ukraine before you start your divorce.